Birch is an available top option on all furniture. Birch is a hardwood option for those customers who prefer a harder more durable surface than pine. Birch has a clean grain look with no visible knots and is comparable to Maple without the high cost associated with Maple. We finish in your choice of Natural, Puritan Pine, Walnut, Black Cherry, or Espresso stains. All stains applied to Birch will have a lighter look than that of Pine. 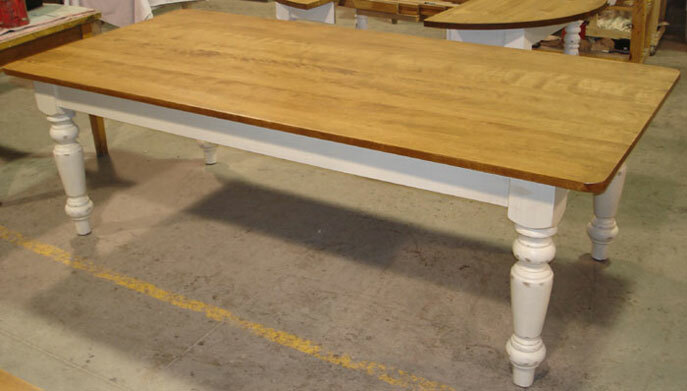 Stains tend to not penetrate as deeply as Pine thus the stain value produced is softer. We apply a stain coat, two coats of varnish, then a furniture wax top coat. The finish is water sealed and requires a simple soap and water clean up.